There are new global functions in XJTAG 3.6 which are always available to use (like the built-in Connection Test). The functions RUNSTAPL and RUNSVF allow users to run programming files without having to write any further XJEase to enable this. These functions call the XJEase functions RUNSTAPL and RUNSVF in order to execute STAPL and SVF files and return the result. To use these new functions, go to the XJRunner Setup Screen and either create a new test group or edit an existing test group. 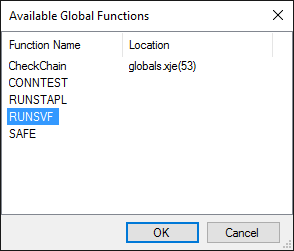 Then click “Add Global Function”, select RUNSTAPL or RUNSVF and then click OK. By default, a popup window will appear asking if you want to set the parameters immediately. When setting these parameters, you can browse for the file you want to run, or you can type in the filename manually (providing either the absolute path, or the path relative to the project directory). Fill in the action (RUNSTAPL only) and devices (both RUNSVF and RUNSTAPL) parameters, then change the autoskew and reset options if desired (both enabled by default) to complete setting up the function. The XJEase statement SAFE (used to set the JTAG chain into a SAFE state) has also been added as a global function. It can be accessed in the same way as RUNSVF and RUNSTAPL, but does not require any arguments.